Although we say, “until death do us part” and fully expect our lives with that special someone to last forever, unfortunately, sometimes those expectations fall short of the reality. Whether it’s because one spouse did something unforgivable or you simply grew apart, divorce may become the new reality. As an attorney, I often find that by the time a client has made it into my office, much of the damage has already been done. This article was inspired by such clients in an effort to prevent the same type of damage to others who find themselves in similar circumstances. Make no mistake, although we would like to think the person we committed our lives to would never purposefully try to deceive or deprive us, a divorce can be, and often is, a battle to be won or lost. Recognizing this fact and understanding the “Art of War” is the first proactive thing a spouse can do for themselves. It was Sun Tzu, a Chinese military general and strategist, who literally wrote the book and emphasized the importance of preparation for any victory. His words transcend the battlefield and could not be truer than they are here. Proper preparation can mean the difference between victory or defeat, and much of a divorce battle is fought before the first court filing. If you feel like your spouse is contemplating the Big D, it is important that you do what is necessary to protect yourself. This is especially true for a spouse who has typically relied on the other to manage the family’s financial affairs. Too many times a spouse will meet with an attorney for the first time and won’t even know how much money is in the joint checking account, has never looked at a bank statement, and has no idea where the family income is being invested or what the actual living expenses are. This information is vital to a divorce action. So, if your “Spidey senses” are going off, and you feel like your spouse may be considering divorce, now is the time to start collecting this information. While you have access to computers, login information or files, start making copies of bank statements, utility bills, investment accounts, tax returns and your spouses pay stubs. Having this information beforehand will also help keep your legal fees down because it will give your attorney a starting point in negotiations as well as provide information necessary for the Court. I have included a Divorce Documentation Checklist to help you navigate this process. Another vital aspect of divorce preparation is knowing what your rights are. If you and your spouse own a home, don’t assume your spouse can just force you out. You have just as much right to stay there as he or she does. It is much easier to remain in the marital home than to try and regain access later. However, I must also emphasize that if you feel you or your children are unsafe or in any sort of danger from your spouse, seek an attorney immediately to get a protective order in place. You can request the Court’s assistance in this regard, but never stay in a place where you feel your safety is at risk. If your spouse is the primary income earner, you are entitled to continued financial support throughout the divorce proceedings. Once either party has filed the initial complaint for divorce, the Court will put certain restrictions into place. These restrictions are called Statutory Injunctions and are intended to prevent a spouse from, among other things, closing marital accounts, hiding or moving assets, destroying evidence, cancelling insurance or dissipating marital funds. A list of these restrictions can be found in Tennessee Code Annotated § 36-4-106. If one spouse violates these injunctions after they have been put into place, the other spouse can seek relief from the Court. So many times, people enter a divorce governed by their emotions. Keeping those emotions in check is probably the most difficult task for a spouse looking at divorce. You are angry, hurt, scared or all of the above. Although these feelings are perfectly normal and often times understandable, it will be much better for you in the long run to try and separate your emotions from the proceedings. Revenge is not a form of relief the Court will provide. Although Tennessee does allow for grounds-based divorce actions, the Court will not consider these grounds in division of the marital estate. A divorce can be overwhelming, and it is easy to be consumed by it. So, before you get in too deep, think about what is really important and set realistic expectations. Know what you have and what you need to make it through the divorce and ensure your financial security. Having a good grasp on this information will also help your attorney better advocate for you. Be leery of a settlement offer that seems too good to be true. Often times it is. A prime example of this and a common mistake of divorce clients is giving up your interest in a retirement pension in exchange for retaining the marital home. Although on its face, this may seem like an equitable compromise, one asset comes with liability and financial obligations while the other generates income with no expense. This is why it is so important to have an experienced divorce attorney review any and all offers before acceptance. While this article in no way covers every pitfall or every facet of divorce preparation, it may provide you with a good starting point. Although I am a licensed attorney in the state of Tennessee, this article does not constitute legal advice or establish an attorney-client relationship with the reader. It is intended for informational purposes only. However, I do recommend that if you are facing the possibility of divorce, seek legal counsel as soon as possible and start gathering information with which to arm yourself. 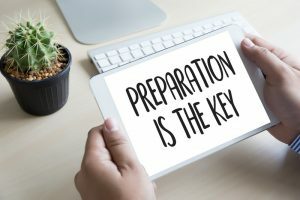 Preparation will be your biggest weapon and might possibly help you avoid a long drawn out battle in favor of a civil and equitable outcome.